Daniel J. Murphy - dmurphy@shawmedia.com Tim Naughton from The Granite Guys sets a new mirror Thursday May 3, 2012 at a home on the market in Crystal Lake. 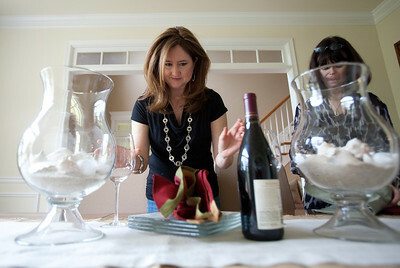 Daniel J. Murphy - dmurphy@shawmedia.com Shelley Brucki (center) and Tammy Shimp (right) co-owners Innovative House Dressing place decorative items on the dinning room table Thursday May 3, 2012 at a home on the market in Crystal Lake. 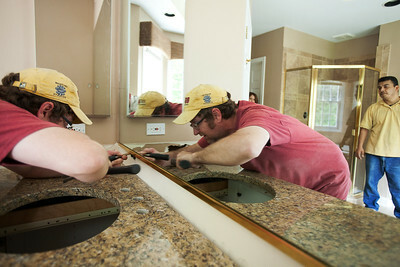 Tim Naughton from The Granite Guys sets a new mirror Thursday May 3, 2012 at a home on the market in Crystal Lake.